A great article in a recent Whole Living takes another look at modern day bread. All of the sudden it seems like half of us can’t tolerate this staple we grew up on. What’s going on with gluten and America? Whole Living closely looks at how wheat, in particular bread, has changed over the years. You’re introduced to the difference between your average bread – all made with a single strain of yeast (Saccharomyces cerevisiae) vs. artisan breads (on the rise) made from fermented dough – and why some of the most gluten-sensitive folks are easily able to digest it. The article dives into how and why the wheat we are eating is an entirely different product than what were eating 10,000 years ago. Celiac disease (permanent autoimmune disorder) and symptoms of gluten sensitivity (non-autoimmune digestive disorder) have been on the rise since WWII. The rate of celiac disease in the US has risen over 400% in 50 years – and that doesn’t account for those without celiac, just gluten sensitivities . So what’s changed in the past 50 years? Well there’s two things. First: The way we grow and process glutinous grains (think fertilizers, GMO seeds, and hard milling processes). Second: The process of turning flour to dough; today’s common method is adding quick rising yeast instead of traditional fermentation, which maintains live microbes. What do these microbes do? 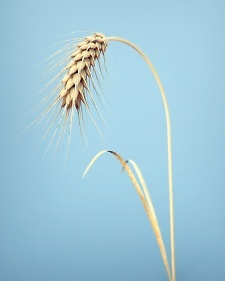 One study published in 2007, in Applied and Environmental Microbiology, found that “When wheat bread was thoroughly fermented, it reduced gluten levels from roughly 75,000 parts per million to 12 – a level that technically qualifies as a gluten-free.” The live microbes break down the gluten and sugars into more digestible elements. Check out the article for more interesting detail. Bottom line: is it the wheat itself or what we’ve done to it that’s causing so many problems? Just another reason to re-think the big brand packaged foods you may be consuming, and perhaps learn more about traditional foods. Regardleess, as both a nutritionist and a gluten sensitive individual, I’d approach anything made with glutinous grains (wheat, rye, barley, triticale), traditionally prepared or not, with very serious caution…and not at all if you have celiac. It’s just not worth it! Check out The Root of Health’s gluten-free page for some ideas on living without.